A few years ago, in an effort to teach my kids about the joys of growing our own food, I built several raised beds to house all the yummies that were sure to come. We lucked out that first year and got a good return (including this 65 pound pumpkin! ), and we've been excited about gardening since. The boys now eat veggies they never did before because "they taste different than the ones at the grocery store." That will sell any parent, plus I love that I spend less at the grocery store each summer! If you garden (or even if you don't... yet), this is the time of year to start planning your garden. If you're a seasoned gardener, you probably already know what you plan on growing but, like me, are excited to try new things. If you're new to gardening, you may not know where to start and it may seem overwhelming. 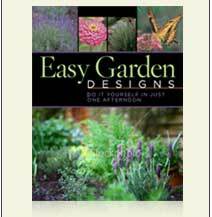 Enter Rodale's Easy Garden Designs guide. If you have a large space, you'll find some great ideas for how to fill it. If all you have room for are some containers, you'll still find valuable growing information that will help you choose the perfect plants. What's even more perfect is that you can download it here for free. Yup, FREE! A pretty awesome price for a head start to planning a garden that will help you live mindfully this year.